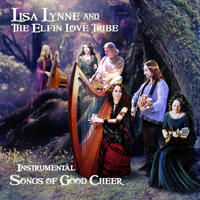 Lisa Lynne : Lisa Lynne and the Elfin Love Tribe, Instrumental Songs of Good Cheer. inspirational, uplifting, gentle, and soothing celtic harp, world flutes, guitar and more.. The Elfin Love Tribe plays with a bountiful collection of instrumental tunes to lift the spirit and celebrate life. Celtic Harps, World flutes, Swedish Nyckelharpa, mandolins and dulcimers weave and exquisite and festive array of musical delights. License inspirational, uplifting, gentle, and soothing celtic harp, world flutes, guitar and more. by Lisa Lynne for your project. Play the music of Lisa Lynne in your restaurant or store.